This is the first game in the Xevious series. For other games in the series see the Xevious category. 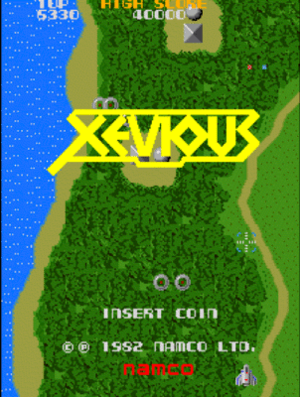 Xevious is an arcade game designed by Masanobu Endoh, one of Japan's most respected game creators and the mastermind behind Namco's later arcade hit of '84, The Tower of Druaga. Xevious was one of the earliest vertical scrolling shootemups, and undoubtably shaped the shoot 'em up genre that it helped to create. Following the wake of popularity of games like Space Invaders, Galaxian, and Galaga, Endoh desired to make a far more realistic game. Unlike those games, enemies do not sit passively in a formation or take kamikaze dives at your ship. Endoh did not think that a real enemy would behave so recklessly. Instead, they get as close as possible, take a good shot at you, and retreat to the top or the sides of the screen. It runs on three Zilog Z80 run at 3.072 MHz. In addition to this realistic Artificial Intelligence, the game itself also ran on a kind of A.I. that adapted the challenges of the game to your performance. If you were clearing enemies rather quickly, Xevious ramped up the challenge by throwing a different type of enemy at you. If you played aggressively, Xevious responded more aggressively as well. This concept would be revisited several times, most notably by Compile's Zanac, in 1986. Xevious had many other things going for it, including not one, but two forms of weapons, one for the air and one for the ground. Visually, it contained realistically shaded enemy characters, and an eyepopping scrolling background which went beyond what most arcade gamers had seen at the time. In addition to all of those, there were several secrets tucked away into the game for players to discover that kept them coming back to it, and a giant mothership that served as one of the earliest templates for a game boss. Because of all this, Xevious was a massive hit in Japan. However, Xevious was only a modest success in the United States, where it was licensed and published by Atari. Divides in taste were never made more apparent than with Xevious, as Endoh had no problem designing a game whose challenge was ramped differently from one play experience to the next, and placing secrets randomly throughout the landscape, with very little indication to their whereabouts. Nevertheless, the game was ported to several consoles and computers. The Famicom version is a particularly celebrated early release for Japanese players. 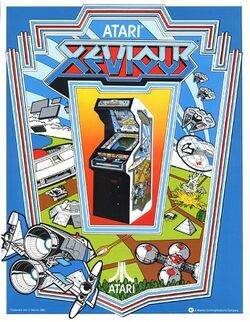 Xevious tells the story of the fight between humankind and the supercomputer "GAMP", which controls the alien forces of planet Xevious. As the sci-fi cliché dictates, it turns out that the Xevious inhabitants are originally from earth, and GAMP (General Artificial Matrix Producer) was the product of an ancient civilization, that prospered on earth a hundred thousand years ago. During this golden age, the "Gamps" were human clones used in heavy labor, until they rebelled to their own creators. In order to survive the upcoming Ice Age, they planned to leave earth and migrate in search of a new homeland. They finally selected seven planets which were likely suitable to human life. Right before the departure, a group of humans rebelled to them and decided to stay on earth anyway. It is from here that thousand years after the leaving of "Gamps", the brave pilot Mu and his android companion Eve decided to travel to Xevious (literally "the fourth planet") to avoid glaciation. They will not receive a warm welcome from their ancestors, though: captured and imprisoned, they discover that the Xevians are actually planning a massive comeback on the earth, so it will now be up to them to send them back home. Fast forward to our days: all above the earth's surface, and near the ancient civilization remains, giant artifacts suddenly emerge from the soil and activate: they are SOL towers, buried underground and inactive for eons, now responding to GAMP's orders. The invasion has begun: it is now that, with perfect timing, Mu, Eve and Mio Veetha, a Xevian who opposes to the Gamp's regime and freed our duo from prisoning, are back on the earth (space travel takes all this time, you see) on the Solvalou ship and ready to fight Gamp's army. Meanwhile, archaeologists Susan Meyer and Akira Sayaka discovered that the Nazca lines could be hiding an ancient weapon which may be used to counter-attack Gamp's army. It was the ninth best-selling Famicom game released during 1983 and 1984, selling approximately 1,270,000 copies in its lifetime. This page was last edited on 15 June 2014, at 18:18.